Across Abruzzo’s valley and mountains, the Christmas lunch feast more often than not begins with Minestra di Cardi; this is peppery Cardoons that have been cooked in a rich chicken broth with little meatballs. Like so many Abruzzo soups it is substantial dish which can be eaten as a dish in its own right and is perfect for a late winter supper. Cardoons and particularly Cardoon Soup have remained a popular favourite with Mediterranean cultures since Greek and Roman times. Outside Italy, for example in the USA, they are rarely found in the supermarket today, but are becoming frequently available more & more at farmers’ markets. You’ll found them often bound and wrapped in straw as before Cardoons are sent to market, their stalks are blanched by tying them together and wrapping them with straw for 3 weeks. This winter cousin to the artichoke can be picked & eaten from the end of Autumn across the Winter season, it literally has a 5 months growing season in which it can be picked; as it gets warmer the stalks become less peppery and more bitter in taste, and it’s soon really obvious when to stop picking. In appearance they look similar to giant ribbed celery, but the taste is artichoke and you can alternatively steam or braise them. 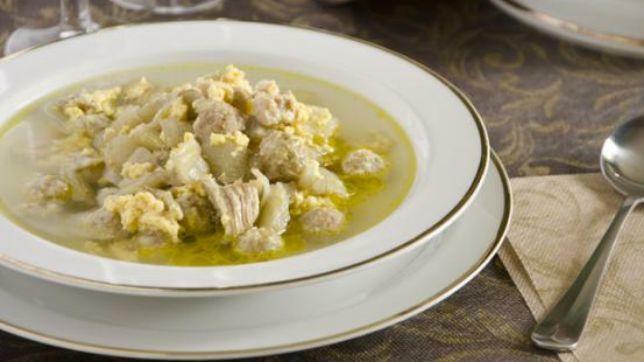 Here’s the age-old Famiglia Di Crescenso recipe for Abruzzo Cardoon Soup all the way from Guardiagrele, Chieti, still much loved by family members Rosanna & Giuliana from Chicago who have contributed this piece! 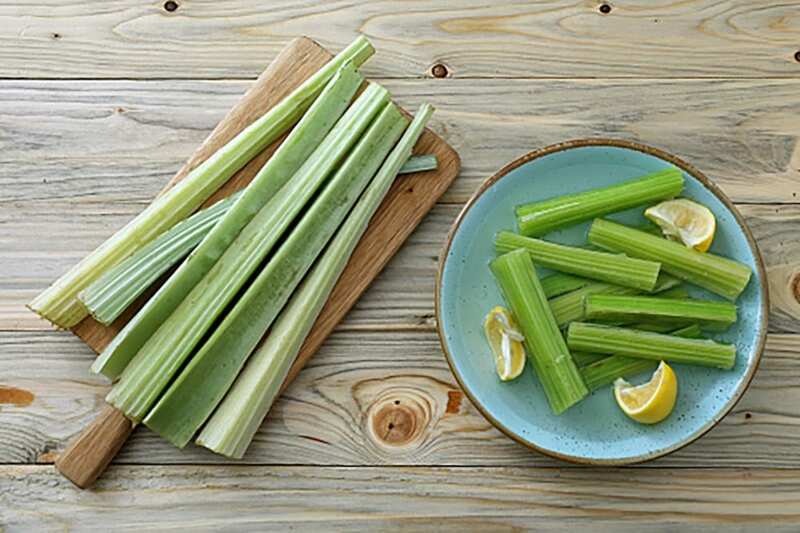 Clean The Cardoons by cutting the bottom off and stripping away the fibrous spines – the same as if you were pulling the tough fibers out of a celery stalk. Be careful when removing the spines as they can hurt if they get lodged in your fingers. Trim away all the woody hearts of the larger stalks, wash well, and rub with lemon to stop them going black. Cut each stalk into half ready for the boiling process (you can also boil them the day before you cook the soup). Boil the halved stalks in plenty of salted water for 30 minutes or until fork-tender. Let cool, and then cut into 1.5 cm (half-inch) pieces. Prepare the rich chicken stock by boiling 1 whole onion, the 2 celery stalks and a whole chicken (capon) with a pinch of salt for 4 hours in a covered pot. Whilst this is cooking, prepare the meatballs, these can be made ahead or even frozen in advance. In a large bowl combine the meat, 3 eggs, 1 cup of finely grated Pecorino and a pinch of salt together. Don’t overdo the salt as Pecorino is quite a salty cheese. Roll into tiny meatballs that are no bigger than the size of hazelnuts. Remove the chicken and vegetables from the liquid you’ve been simmering it in. In this large stock pot, brown the meatballs and then add back in the stock and cardoons, bringing it all slowly back up to the boil and then allow to simmer for 15 minutes. Once it is gently simmering add 4 beaten eggs into the soup, whisking them with a fork to scramble into stracciatelle; add a handful of pecorino cheese according to taste. For those that don’t like egg >stracciatelle, we suggest instead substituting it with a small square egg noodle pasta or pastina.